A great alternative to blinds, our made-to-measure curtains are ideal for homes of any size, type and decor. Using only the best materials and design techniques, our range of curtains are custom-made to fit your specifications down to the most minute of details. When you choose Humberside Sunblinds for your curtains, you will benefit from the expertise of our friendly, experienced team, who will go the extra mile to ensure you get the curtains you want. 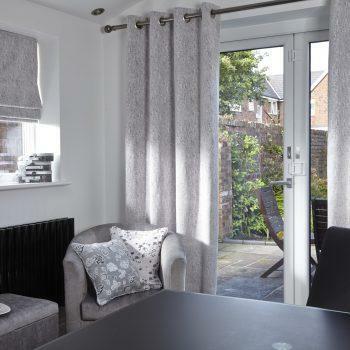 We work in an efficient, professional manner to ensure your custom-made curtains are fitted perfectly with minimal turnaround time, so you can enjoy the ideal climate and lighting in your home. Eyelet headed curtains are the perfect contemporary alternative to using curtain hooks so can be used to update an old curtain pole. They are very easy to fit, and offer an elegant finish as the curtains fold into large, even pleats. Eyelet curtains can not be used with curtain tracks or valances. Pinch pleat is a more decorative heading for curtains that can also be used for valances. They can be fitted to any type of curtain track or pole, offering a neat and tidy finish as the they feature permanent, sewn-in pleats for a more luxurious and tailored look. Pencil pleat curtains have a more traditional heading. They feature a lot of neat little folds at the top of the curtain, where it is attached to the track. Pencil pleat headings are very popular and complement both traditional or contemporary decors. Blackout fabrics are backed with a special material that stops light filtering into the room, and can be applied to many different styles of curtain. Blackout fabrics are often used in bedrooms and in quality hotel rooms, to ensure sleep isn’t disturbed by sunlight. Voile is a soft, opaque fabric, usually made from cotton, linen or polyester. Voile curtains are often paired with heavier curtains or blinds to add a decorative finish to the window dressing, and as a contemporary alternative to net curtains as they provide privacy while allowing natural light to filter into a room. Electric or remote controlled curtains and blinds are often installed in businesses and homes in which the windows are particularly large. By using electric operation, the curtains or blinds can be quickly and easily open or closed at the touch of a button, without the risk of damaging the material. Stage drapes or theatre curtains are essential to conceal the stage from the audience, and can also be used to create on-stage special effects. Each set of stage curtains should be bespoke and made to measure from a suitable, heavy and durable material. Tab top curtains hang from the curtain poles with loops of material, rather than hooks. They are a very simple design and easy to fit, offering a much more contemporary look and finish. Interlining is when an additional layer of fabric is sewn between the decorative curtain fabric and its lining material. By doing this, interlining provides a better drape, so even curtains made of a light material hang well. It also provides protection from sunlight as well as noise and sound insulation.